Very few writers begin their early career with a bestselling novel, a book of poetry, or a reporting gig at a high-end magazine. Often, the first paycheck they earn isn’t from their pen; it’s from the sweat of their brow while they work grueling, everyday jobs. When writers do put pen to paper, detailing the ironies and eccentricities of working as a bus driver, teacher, or waiter, their experiences make for fascinating reading. 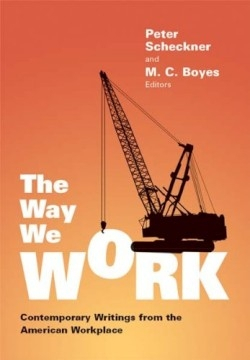 That’s clearly seen in The Way We Work, a collection of short fiction, poetry, and nonfiction on the modern work place. Editors Peter Scheckner and M.C. Boyes have assembled a wonderful mix of contemporary prose and poetry that depicts life on the job in a wide variety of fields. In Tom Wolfe’s “The Suicidal Freezer Unit,” an on-site accident changes the lives of a team of box loaders. “Womanhood,” a poem by Catherine Anderson, describes a teenager’s bittersweet initiation into the life of a textile worker. Amanda Scheiderer’s “Dirty Talk” recounts her experiences with a lonely customer while working as a stripper. Naturally, the stories capture a snapshot of issues in the modern workforce. Erika Meitner’s poem “Job” hints at the unstable future of employment in office work. Ha Jin’s “After Cowboy Chicken Came to Town” details the pitfalls of globalization when an American fast food restaurant moves to China. “The River Bottom Ranch” by Marcial Gonzalez is one of several pieces in the collection that focus on immigrant workers. Ultimately, The Way We Work is less about work and more about the humanity of people in the workforce. The sheer nature of work presents every character in these stories with some sort of difficult situation. There are no simple answers or pat solutions and the outcome of these characters’ choices is often neither good nor bad. Like the banality of work, the result simply is. While this collection is ideal for academics teaching on issues of modern employment or class struggle, The Way We Work is also perfect for anyone who simply loves reading good prose and poetry. It’s a book that readers will love to pick up again and again, particularly if they have to smuggle the book onto the factory line, behind the counter, or into their cubicle to read it.